Forget Facebook, Amazon and those other tech companies. One of the hottest stocks on Wall Street is a company that makes social connections by delivering pizza. Domino's stock surged 8% Thursday to a new record after reporting earnings and sales that topped forecasts. Domino's has done just about everything right over the past couple of years. An ad campaign featuring CEO Patrick Doyle that made fun of how bad the pizza used to be won over customers because of its brutal honesty. Domino's has also embraced technology, letting pizza lovers order with emojis via a text, tweets and voice assistants, such as the Alexa-powered Amazon Echo. And the company just announced that customers can use its app to order pizza delivery to beaches and other outdoor public places. Maybe Domino's deserves to be in the tech club after all? It would be easy to make fun of Domino's for all these gimmicks, but they are clearly working. Domino's reported a more-than-8% jump at US locations open at least a year. 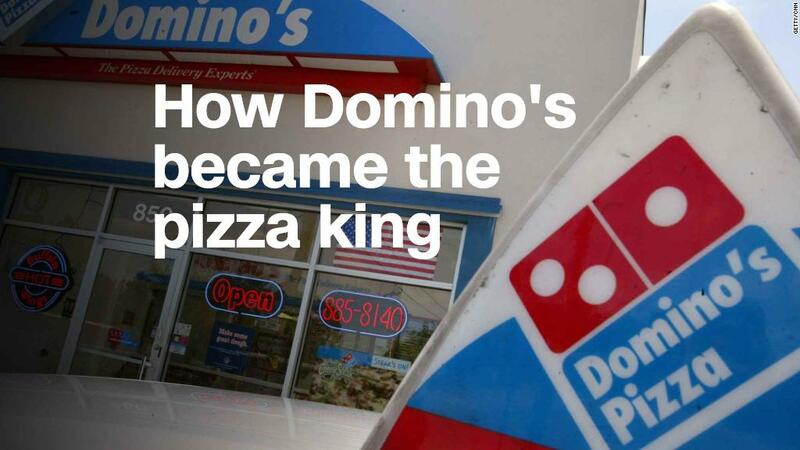 That's a stunning level of growth for a company as big and mature as Domino's. It's also the reason why Domino's stock has been a better performer than rivals Papa John's (PZZA) and Pizza Hut owner Yum! Brands (YUM) over the past few years. Papa John's in particular has struggled lately. The stock is down 20% during the past 12 months. Founder and former CEO John Schnatter blamed weak sales on the national anthem protests by some NFL players last season. Papa John's was the official pizza sponsor of the NFL at the time. But the league and Papa John's have since split ways. Pizza Hut is now the new NFL pizza sponsor. And Schnatter stepped down as CEO. So Domino's is clearly on top of the pizza world right now. And investors don't seem too concerned that the architect of the company's turnaround, CEO Patrick Doyle, is stepping down this summer. Doyle's successor, Domino's International President Richard Allison, takes over on July 1. And the international business is thriving too. Domino's said Thursday that of the 110 new stores it opened last quarter, 79 were outside the US. International same store sales also rose 5% in the quarter and were up 13% overall after excluding the impact of currency fluctuations. So based on how well Domino's is doing abroad, it looks like investors have nothing to worry about once Doyle passes the pizza shovel to Allison.